Our training philosophy is based on canine psychology. Dogs are pack animals and it is important for them to utilize their mental energy in order to be balanced, happy and confident in their pack role. Much of the training involves "shaping". With shaping, one task is broken down into several smaller steps. This type of training encourages your dog to use their mental energy to achieve the task and positively encourages your dog to offer desirable behaviors on their own. All dogs need training to help them realize their potential, fulfill their pack role and achieve balanced behavior. The primary goal of training is to open a line of communication, mutual respect, and trust between you and your dog, while bonding through the training process. Your dog will be trained in the comfort of your home. In home training is desirable because it is a low distraction environment and allows beginner dogs to keep focused on learning new things. This package includes 6 in-home Sit & Train lessons in Basic Obedience covering 9 training commands: “Yes” verbal marker, “Name recognition", Crate training, "Heel" for loose leash walking, "Sit", “Down”, recall “Come”, "Place" (boundary stay), "Down", a Release Command of your choice, as well as behavior solutions, such as, "Off" used for jumping. Each session is one hour in length, scheduled once a week, for six consecutive weeks. A weekly Report Card with pictures, and homework is emailed to the owner. A Basic Obedience Certificate is awarded upon completion of the course. Be prepared to practice daily for at least 30 minutes. Have your dog trained while you’re at work for the day! Your dog will be trained while attending doggy daycare at Perfect Pets, 1 day per week, for 6 weeks, totaling 6 lessons. Your dog will receive two training sessions per day (30 minutes each), morning and afternoon, totaling 1 hour of one-on-one training while attending daycare. This package includes 6 ‘Stay & Train’ lessons in Basic Obedience covering 9 training commands: “Yes” verbal marker, “Name recognition", Crate training, "Heel" for loose leash walking, "Sit", “Down”, recall “Come”, "Place" (boundary stay), "Down", a Release Command of your choice, as well as behavior solutions, such as, "Off", used for jumping. A weekly Report Card with videos, homework, and pictures is emailed to the owner daily, and a Basic Obedience Certificate is awarded upon completion of this 6-week course. Be prepared to practice daily for at least 30 minutes. **Your dog must be a part of our daycare program and have an evaluation prior to training. This option is for dogs who already know the basics. 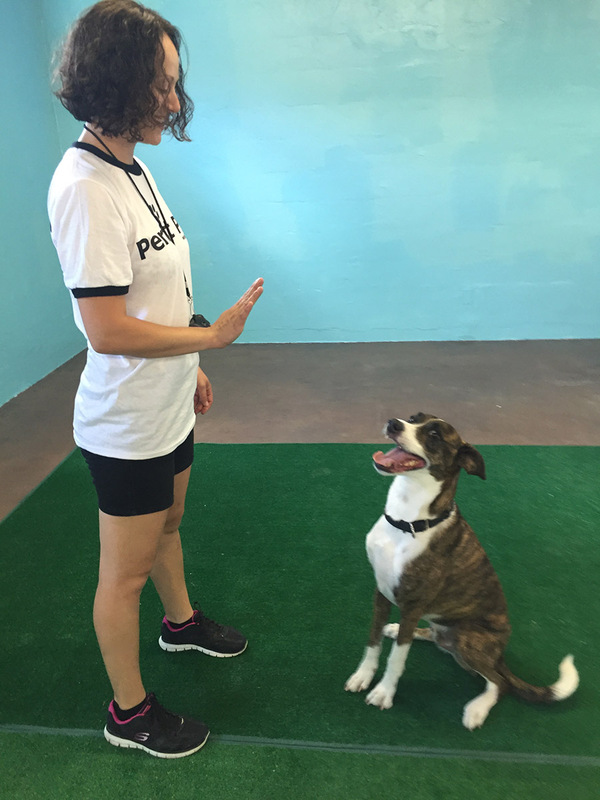 This Advanced Obedience package is 6 weeks long and includes adding distractions to the Basic Obedience commands listed in the above packages, as well as, "Sit Stay", “Down Stay”, "Come to Heel", off-leash Heel, "Leave it", "Sit" and "Down" at a distance, "Wait" at doors, out of sight Stay, Hand Signals, Advanced Crate training, and "Place" with added duration, and distractions. A weekly Report Card with homework, pictures and videos (if owner is not present) is emailed to the owner daily, and an Advanced Obedience Certificate is awarded upon completion of the course. Be prepared to practice daily for at least 30 minutes. This 12-week course covers all Basic and Advanced Obedience commands listed in the above packages. A certificate for each 6-week program will be awarded upon completion of each course. A weekly Report Card with homework, pictures, and videos (if owner is not present), is emailed to the owner daily. Be prepared to practice daily for at least 30 minutes. This course is all about having fun and bonding with your dog. It helps build confidence in shy dogs and is great mental exercise for dogs of any age. Yes, even old dogs can learn new tricks! 13 Basic Tricks are included in this package: “Peek-A-Boo”, "Rollover", Hand target, Chin Target, "Spin" (left and right), "Leg Weave", "Take a Bow", "Paw (left and right)", "Hoop", "Jump", "Crawl", "Sit Pretty", "Tidy Up Your Toys". Beginner Tricks includes one hour lessons, once per week, for six weeks. A Beginner Tricks Certificate is awarded upon completion of the course and weekly Report Cards with homework, pictures, and videos (if owner is not present), is emailed to the owner daily. Be prepared to practice daily for at least 30 minutes. Available for basic and advanced obedience graduates who need to stay sharp on their commands. Customized training to fit you and your dog’s specific needs. Does your dog need help on jumping? Getting in the car? Swim lessons? Whatever your need, Perfect Pets can help.